This Popup Plugin is WordPress 5.1+ compatible. You can easily create popups from our pre-made templates with few clicks. We have developed it so that you can add any type of content within your popups. Master Popups includes a system of capturing subscribers by email so you can get more subscribers and save all your data directly to WordPress or in your favorite email service as Mailchimp, Mautic, GetResponse, Mailster, Sendinblue, etc. Master Popup es un potente plugin para crear fácilmente popups y formularios de suscripción por email gracias a su editor visual de popups y a las más de 40 plantillas prediseñadas con las que cuenta y que son totalmente personalizables. Master Popups tiene la mejor integración con servicios de email marketing como Mailchimp, Mautic, GetResponse, Mailster, Sendinblue, etc, ya que se conecta fácilmente con cualquier servicio, extrae sus campos personalizados automáticamente y te permite elegir las listas con las que deseas trabajar. Master Popups es compatible con WPML, es muy fácil configurar y mostrar tu popup en diferentes idiomas, sólo debes seguir los pasos explicados en este artículo. What can you create with Master Popups? What can you show in any Popup? Master Popups allows you to get more subscribers thanks to easy integration with email marketing services like Mailchimp, GetResponse, Mailer Lite, Constant Contact, Sendinblue, Autopilot, etc. Master Popups te permite obtener más suscriptores gracias a la fácil integración con servicios de email marketing como Mailchimp, GetResponse, Mailer Lite, Constant Contact, Sendinblue, Autopilot, etc. 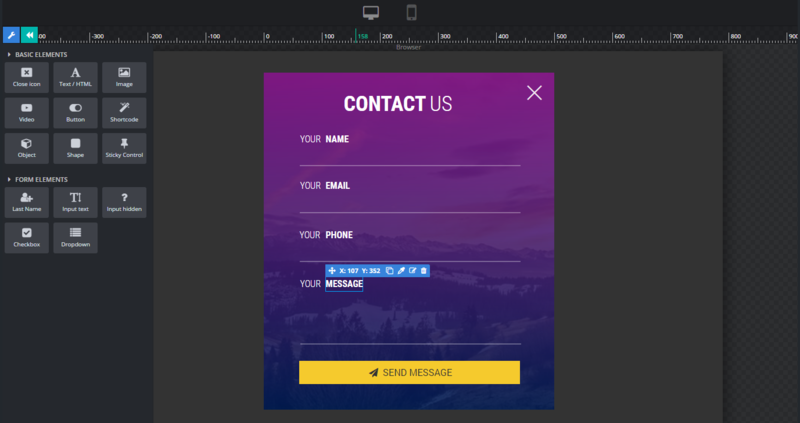 Master Popups is not only a popup plugin, you can also use it as a contact form to be more connected with your potential customers. You can even embed any shortcode from plugins such as Contact From 7, Gravity Forms, etc. What would you like to do after submitting the form? Display settings are used to control where on your website your popup will appear. You can choose to display your popup on your entire site, or you can choose to display you popup on individual posts or custom post types. Create unlimited popup forms and tailor them to specific pages and specific visitors to increase your conversion rates. For now these are the services that are integrated with Master Popups. But we will add more soon. 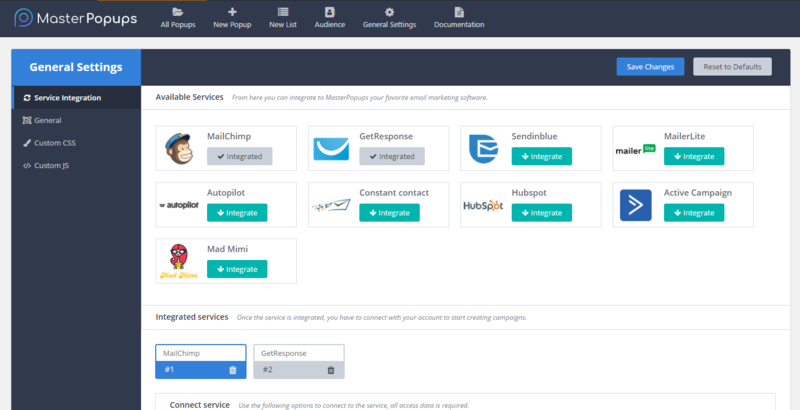 Do you want to see how easy it is connect your CRM Software? Integrating an email marketing service. With Master Popups you can create Modal Popups, Full Screen Popups, Notification Bars, Slide-In popups and Inline & Widget Popups. And we have many features available to make life easier for you. Unlimited popups, you can create as many popups you want. Options to download a file and redirect user after submitting the form. Cookies to show the popup only once. Native Subscription / Contact forms. Save your popup data for use on another website. Trigers – When to run the popup? Show your popups depending on the post/page, category, tags, custom post types, etc. Master Popups has a integrated system that lets you store and manage leads, also can be seamlessly integrated with many third party email marketing services (CRM). Added – New element “Countdown Timer”. Added – New 2 Popup Templates. 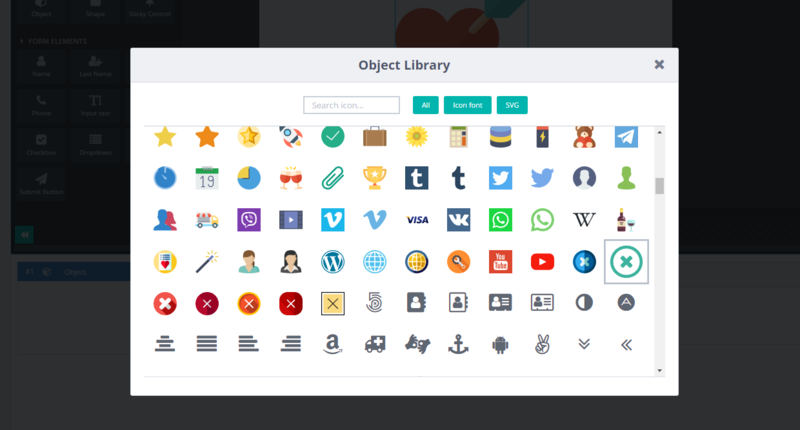 Added – New “iContact” Integration. Added – New “Newsman” Integration. Added – New Option to copy the desktop popup design. Fixed – Fixed an issue when duplicating elements. Added – Double opt-in option for “Mailster” Integration. Added – Added an option to disable popup management by User Roles. Fixed – Fixed small problems reported by users. Fixed – Fixed a small bug in the integration of “Hubspot”. Added – Support for HTML 5 videos was added through a general option to optimize loading times. Updated – Updated “Xbox Framework”. Tool that manages the options. Added – New option “Input type” for the form fields. Fixed – Fixed a small problem with “Dropdown” field. Added – New option “Overwrite user data” for Audience Lists. To update user data in case the email already exists in a list. Added – New General Settings option “Enable popups queue”. By default the popups are displayed one at a time, We have added this option to allow to show multiple popups at time..
Added – 2 New popup templates for Email Subscription. Fixed – Fixed option “Set cookie after conversion” for Contact Forms. Fixed – Fixed a small problem in the popup editor. Added link powered by Master Popups. Added – Now in case of error when sending the form, a more detailed error message will be attached (Service Error). Fixed – Fixed other minor problems reported by users. Added – Strings “Back to form”, “Close” for translations. Added – New parameter “From” for contact forms. Added – New popup template. Added – New Option to use theme links color. Added – New Options to edit form validation messages. Added – New Option to not show the popup in certain URLs. Fixed – Fixed a minor problem with Google Fonts. Added – New WPML Compatible. Added – New Option to duplicate popups..
Added – New Option “Enable Disclaimer Features” for Disclaimer popups. 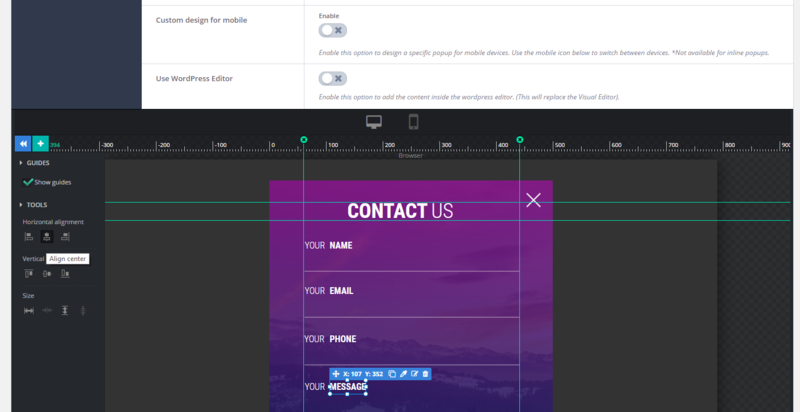 Fixed – Fixed Option “Sticky Control” for Modal popups. Added – New Options to create “Custom Cookies”. 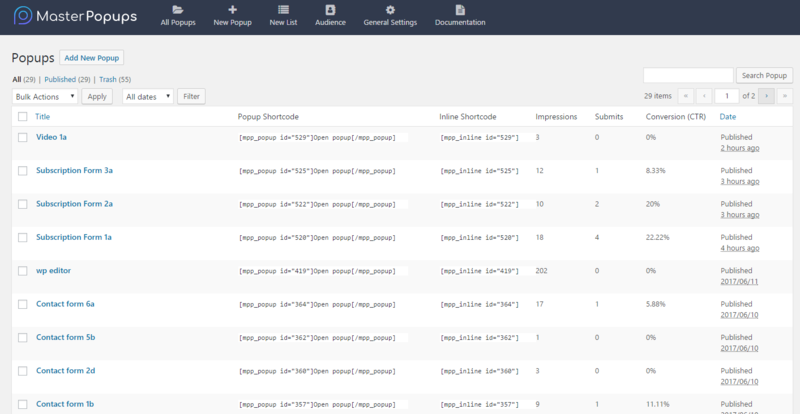 New Hooks to create addons that increase functionality. 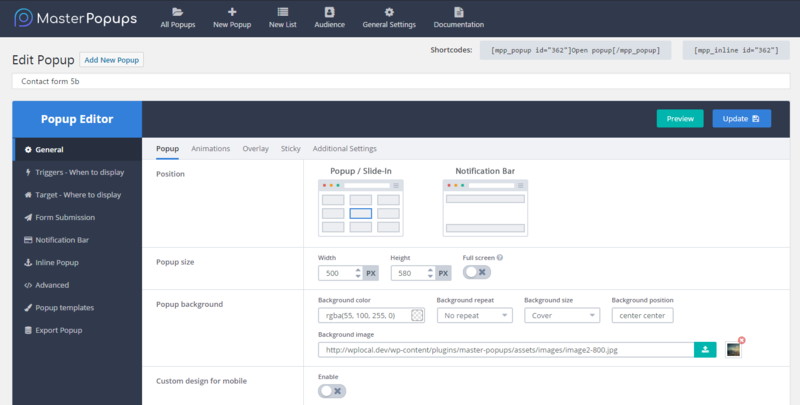 Fixed – Fixed Option “Disable page scroll”. Added – New Options to publish/stop the popup on specific dates. This allows you to create popup campaigns. Added – Popups enqueued. In case there are two or more popups to show when loading the page, they will be displayed one at a time. Fixed – Fixed cURL error 35 on plugin activation. Fixed – Fixed the limit of lists obtained from Mailchimp. Before there was a limit of 10 lists. Added – Popup option “Play Notification Sound”. To play a notification sound when opening the popup. Added – Added 4 new popup templates. 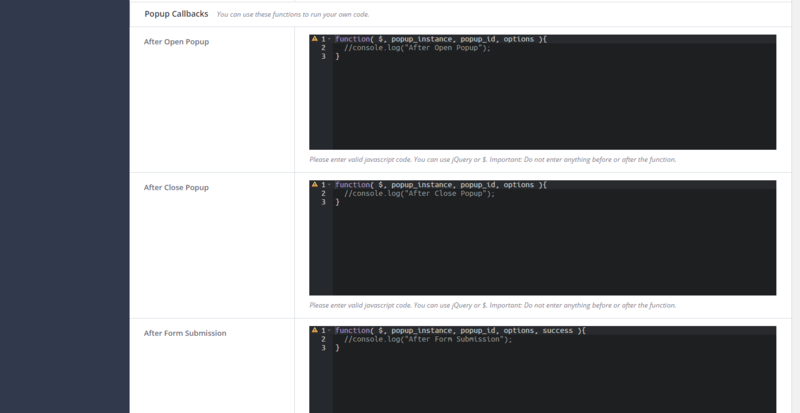 Fixed – Fixed minor problems reported by users. Fixed – Tag/Target page popup options. Added – Popup option “Disable page scroll”. To disable scrolling while the popup is open. Added – Popup option “Load Google Fonts”. Added – I have customized the import options. 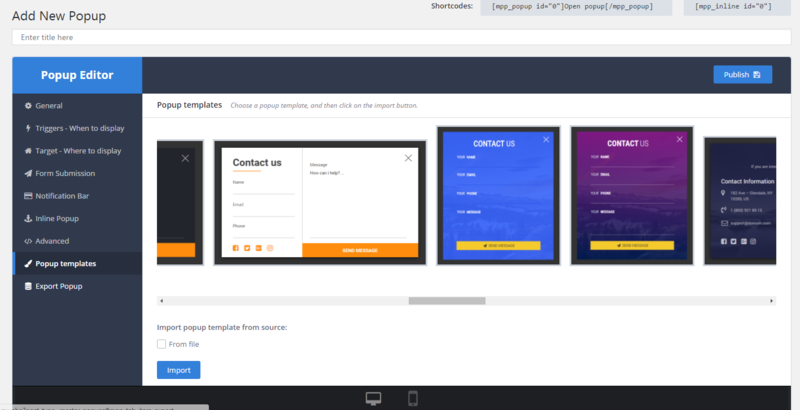 It is now easier to select a popup template. Added – I created the .pot file for translations. Fixed – I have corrected problems reported by users.